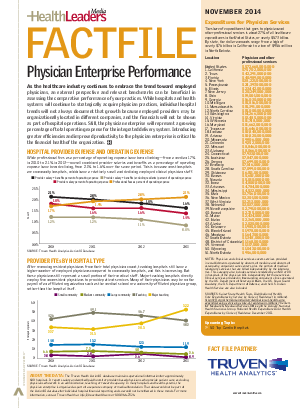 As the healthcare industry continues to embrace the trend toward employed physicians, an external perspective can be beneficial in assessing the comparative performance of your practices. While hospitals and health systems will continue to strategically acquire physician practices, individual hospital trends will not always document that growth because employed providers may be organizationally located in different companies, and the financials will not be shown as part of hospital operations. Still, the physician enterprise will represent a growing percentage of total operating expense for the integrated delivery system. Introducing greater efficiencies and improved productivity to the physician enterprise is critical to the financial health of the organization.